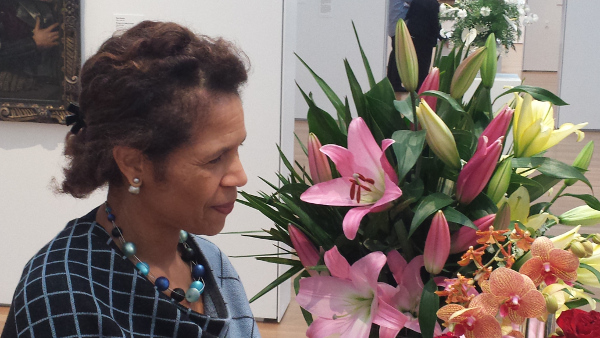 Joyce taking a moment to smell the flowers. I met Joyce a couple years ago when she presented on vitality in the workplace. 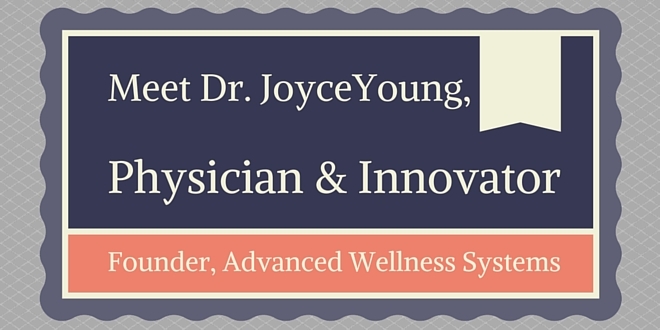 Joyce is a physician, researcher and health promotion practitioner who founded Advanced Wellness Systems. Her company positions people to increase their health, energy, and well-being, leading to high job performance, resilience, and creativity throughout the workplace. I hope you enjoy my conversation with Joyce! As a physician, how did you find your way into the field of Worksite Health & Wellness? Although we have over 750,000 physicians in the United States, fewer than 5,000 physicians are certified in Public Health and Prevention. I trained and became board certified in preventive medicine because of my interest in the health of the population. In my population health work at the national, state, and business level, I’ve enjoyed workplace population health the most, and worksite wellness is a key component of that specialty. You have been involved in consulting with many types and sizes of companies for the past 23 years. What similarities did you see among these companies? I consistently saw a sincere desire to improve employee health. However, each company is unique in the approaches they use to achieve this outcome. You have quite a few publications on your resume, including quite a few about worksite wellness. How difficult is it to conduct worksite wellness research in a practice environment? Less difficult than it used to be given that we have better information-gathering tools, analytics, and experience. A fundamental challenge is that research techniques and methods are very different from the practice world, where program implementation takes priority. This constrains the capacity for effective research to also occur. Sometimes there’s a disconnect between research and how it’s applied (or what actually happens in the workplace). How can we better apply research to worksite wellness? Better methods of translation and more interaction between researchers and wellness program managers are needed. Improved integration of the research and program management disciplines and building on the unique competencies of each would lead to better outcomes. This is an area that is ripe for advancement. Tell me how you founded your company, Advanced Wellness Systems. A single theme emerged from all organizations and environments that I encountered in my years of developing, implementing, evaluating, and consulting on employee health and wellness programs. That theme is there is no easy way for companies to implement robust wellness programs for enhancing health and energy. Advanced Wellness Systems was founded to make it easy for companies and organizations of any size to provide robust wellness programs that position people to reach new levels of health and energy, leading to high job performance, resilience, and creativity. I was fascinated at how you found all of your experts for your Springboard platform. Can you tell us how many experts you have and in what fields of research? The life’s work of our 10 subject matter experts is represented in the program’s overall design, its specific practices, and its feedback engines. In addition we have a small team of wellness program managers who bring a combined 35+ years of practical experience in web development, program implementation, and evaluation. Wellness programs rarely include anything about nature and how it helps our overall well-being. At a high level, what’s the research around the influence of nature on our well-being? How can we incorporate this into wellness programming? Research shows that regular nature exposure restores mental energy and attention leading to improved cognitive focus, creativity, and overall balance. Any exposure to nature is beneficial — from viewing nature scenes in pictures or through windows, to visiting local gardens, hiking, or backpacking. Wellness programs can promote the benefits of nature in their outreach activities, work with companies on enriching views from windows, incorporating live or artificial interior plants, and including nature scenes in wall hangings and even screen savers. More advanced wellness programs would offer the means (i.e., training, logging, and feedback) for individuals to develop the practice of incorporating nature into their lifestyles on a regular and repeated basis. What is your #1 goal with starting your own wellness company? To connect people with effective methods for enhancing health, energy, and well-being. What’s the role of the employer in worksite wellness programming? Cultural attributes have a tremendous impact upon individual actions. They influence choices and determine the effectiveness of work-related initiatives. A key employer role is in creating an environment that supports high well-being and in facilitating access to effective employee wellness initiatives. How have you seen worksite wellness change over your career? What’s wrong with the wellness industry today? What’s right with it? Many people have benefited from exposure to and participation in health-promoting education and activities sponsored by their workplaces. Over time company leaders and decision makers have gained a better understanding of how their employees and their company benefits. This creates a foundation upon which the field can evolve, incorporating new science and methods to make a greater impact. What do you see as the future of worksite wellness? In 2005, Keys & Grzywacz wrote in the Journal of Occupational and Environmental Medicine that the fields of worksite health promotion and occupational health are moving beyond a health cost containment model. At the same time wellness professionals are calling for a more integrated approach in employee health improvement programs. I think these trends will lead to broader programming and more employee ownership in the advancement of their own well-being. How do you develop yourself professionally? While I consistently read professional publications and attend conferences, my most effective development comes from the deep interaction I have with our subject matter experts. Working with them to translate their research findings and methods into personal practices requires immersion into the subject. The process is like taking an independent study course and submitting a final project for academic credit. Do you have any habits you feel contribute to your success? Over the years the Springboard practices have enhanced the effectiveness of my personal wellness routine, literally raising my energy and well-being to a higher level. Recently I’ve discovered that even brief engagement with the practices – 2 minutes of mindfulness meditation, brief stretches from the movement practice, and my favorite, the 3-minute nap — have been more effective than I had expected them to be. In addition to the science and evidence, my personal experience strengthens my conviction regarding how powerful these methods are. What do you do for fun (when you’re not working)? Many of my photos are of me in some type of outdoor environment. I’ve jogged with the same group of women for over a decade; the socialization is more fun than the jogging. I generally have one or more garden project going, and I love to read. Parting thoughts/words of wisdom for the lone person creating wellness programming for their employees? Accept that the efforts we all make to improve health and well-being are beneficial at some level whether or not we’re able to identify the results. For more reading about Joyce’s company, read my interview with Carolyn Naseer, who is part of the AWS leadership team.